O’Keeffe painted two versions of the tree, indicating its importance to her. 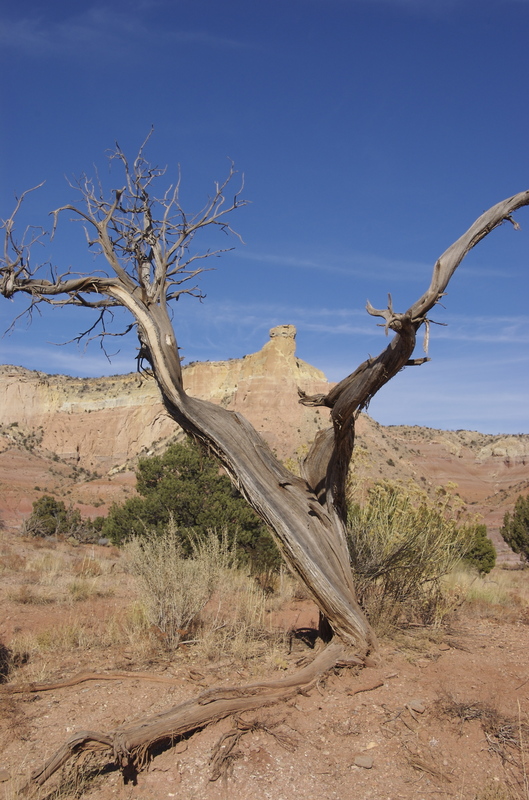 On a visit to Ghost Ranch I heard this story and was captivated. David took this photograph in 2008. The tree has not changed in the years since O’Keefe painted it. That this twisted tree, would be the subject of several painting fascinates me. To see color in dirt takes a willing eye. It is easier to see beauty in vivid flowers or lush forests. The desert makes you work to see it’s unique beauty. Over the years, I have made many trips to the Southwest. One of my favorite pieces of writing is from the novel, Song of the Lark by Willa Cather. This takes place after an intense period of her life as an opera star. She goes to the desert to rest and recuperate. Sitting down in the dirt, or the grass, and letting the sounds and small movements of the tiniest creatures catch your attention is a way to play. Play comes naturally to children. They can play by dancing round the mulberry bush, or by laying down in the tall grass and watching the clouds move across the sky, creating castles and animals in their mind. Or watching a line of ants as they carry their burdens along their well worn tiny paths, letting imagination carry them away.